Amazing retail suite available at the City Center Wasilla complex. Great exposure and visibility at the former locations of All I Saw Cookware. Suite G is 1,728 square feet for $1.90 per square foot. Great potential for a restaurant or café with an extended sidewalk for outdoor seating. 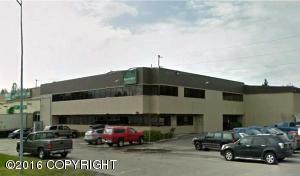 Great warehouse unit at the fast growing City Center Wasilla commercial complex. Unit is evenly split with 720 square feet of office and 720 square feet of warehouse. 10′ x 12′ overhead door and a floor drain. Meridian Center office/retail suite for lease in a busy and popular complex. Located across from Walmart in Wasilla, this suite is 1,218 square feet with large storefront windows, three private offices, restroom, and great signage availability. Rents for only $1.70 per square foot plus utilities. Efficient second story office suite available for lease. Reasonably priced at $1.07 per square foot plus electric. Landlord pays for heat. Suite has a private office built out and space for reception/waiting area. 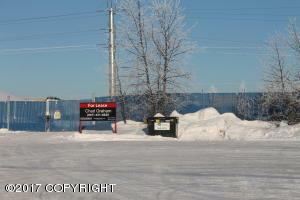 Great location in downtown Wasilla within walking distance to many shops/services. Surplus fenced land. 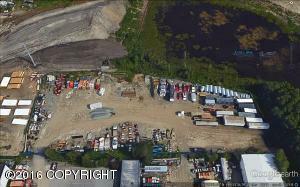 8+ acres ideal for laydown yard, adjacent to rail spur. 3 acres fenced offered at $5,900.00 a month. Additional yard available. Large 2.60 acre commercial lot. 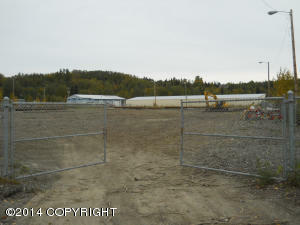 Entirely fenced/gated storage yard directly behind Blazy Const. & Nikko Gardens. Has Kenai Spur Hwy visibility and all utilities are on site. 2 acres I2 in downtown Anchorage. Close to Rail, Trucking, Highways, JBER and Port. 3 Phase nearby. Multiple connexes for storage, quonset huts, shops, and office can be included. Lease with option to purchase, and also for sale.